There is something about Queen Charlotte that I have always found utterly fascinating. My interest in her was sparked years ago by a portrait that I have since featured here at the Guide and it has never abated. She strikes me as a most graceful lady and one who faced the challenges of her marriage with dignity and forbearance. 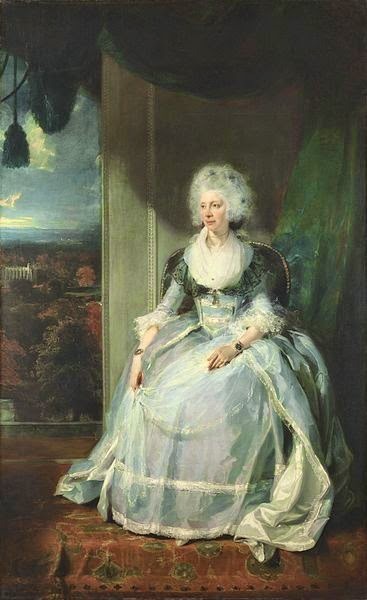 Charlotte married George III in 1761 and was a devoted wife to her husband. Throughout the long years of their marriage, with all the well- documented health problems both physical and mental that George suffered, Charlotte remained his loving and most protective companion. As she entered her seventy fourth year, though, the queen was growing more frail with every passing day. She attempted to continue her duties even as her health worsened but, in spring 1818, was forced to retire from public life with a final appearance at the Mansion House in London. Hoping to eventually take up residence at Windsor with her husband, the ailing queen entered seclusion at Dutch House (now Kew Palace) where, she hoped, she would be able to regain her strength. However, she was destined never to see her husband again and, as the year wore on, rather than gain in strength she deteriorated swiftly. Hidden away with her children, Charlotte suffered terribly as her legs swelled and joints grew sore and eventually she contracted pneumonia. On 17th November 1818 Charlotte settled in a comfortable armchair with her children around her and, with her son, George, holding her hand, the queen passed quietly away. She was buried at Windsor on 2nd December and her husband, suffering from dementia and many other conditions, never learnt of his beloved wife's death. I always wondered how well she knew Sarah Lennox. I'll imagine there are some stories to be told! Reading Mrs Burneys diaries,the Queen always came across as a gracious and caring lady indeed,Madame. Likewise with dear Mrs Delaney. But she would never win any mother of the year awards. I have looked at her relationships with some of her children elsewhere, a fascinating family! Probably the most dysfunctional royal family in history. When three of your daughters willingly go into miserable and/or abusive marriages just to escape you, you might have parenting issues! They have some contenders for the most dysfunctional, but they would definitely be in the running! Byron, Blidworth and Beer Gardens! The Execution of "La Pola"